But when does the Mayan Long Count Calendar really end? The CCRG has always speculated that the true end date of the Mayan Long Count Calendar may occur anytime from 2016 to 2023. There are several reasons for identifying this particular window of time; however, everything points to the very real possibility that 2016 marks the real end of the Mayan Long Count Calendar (MLCC). As for the exact day or month which signifies the defining moment, that is impossible to say with any degree of certainty. Why do we recognize 2016 as the final MLCC year that the Mayans were pointing to with their famous and infallible calendar? Just wait and see what eventually transpires during 2016, the Chinese Year of the Fire Monkey and Super Shemitah. The last time there was such a unique astrological convergence with “Pluto transiting Capricorn” was in 1776. Not only does the current race of humanity find itself it the final days of the twilight of the Kali Yuga, the Age of Aquarius has begun in earnest as the Precession of the Equinox completes an approximately 25,792 year cycle. 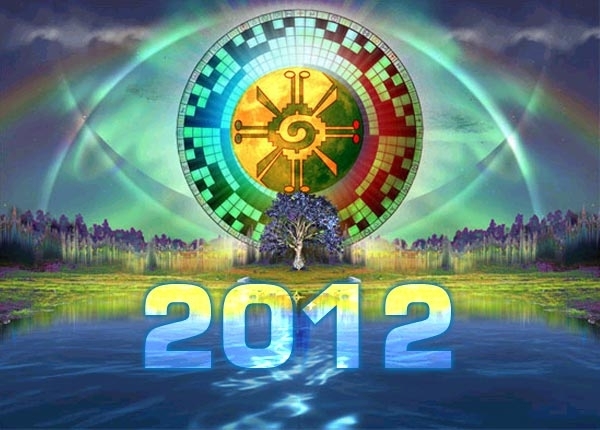 Everyone is asking, “How do we prepare for 2012?” To answer such a question with authority and credibility it would be helpful to understand a little bit more about the overall context of 2012, as well as some significant misconceptions and misunderstandings regarding the Mayan calendar and the 2012 phenomenon. Most importantly, it would seem essential to establish the actual Mayan Long Count timeline as it parallels the Gregorian Calendar. The commonly held understanding is that the Mayan Long Count is a 5125 year-long calendrical cycle beginning somewhere between 3113 and 3115 BC. What appears to be sacred in this school of thought is the 5125 year period which defines the length of the Long Count calendar. However, the precise starting point is obviously up for discussion, as it has been the subject of lively debate by the experts for many years. The key point here is that the start date necessarily determines the end date of the Long Count. Therefore, whoever first arrived at December 21, 2012* must have identified August 11, 3114 BCE (Proleptic Gregorian calendar) as the “zero date” of the Long Count calendar. *December 21, 2012 is often rendered as 13.0.0.0.0 in the Mayan Long Count calendar which simply refers to the end and beginning of a major calendrical cycle, as well as many minor cycles within the Long Count. It positively does not refer to the end of the world or the end of time. Since the current universe will continue to exist in a space time continuum – where change is the rule of each and every day – time will continue to be measured with a variety of chronological systems. Hence, we have, and will continue to have, well beyond 12/21/12 a plethora of calendars around the world, each marking their time in different ways and for different reasons. For their part the Mayan Timekeepers, also known as the Lords of Time, knew of a very unique and special time schedule by which the current Aryan race of humanity would be ushered through this Shift of the Ages. Because of the spiral nature of the Mayan Calendar and the various creation cycles (aka underworlds) contained therein, it is absolutely necessary for those who use this calendar as a predictive tool to have these two dates (start and end dates) conclusively fixed. This task becomes particularly formidable because of the nearly 5125 years of intervening history, and passage of time – time that was not always kept track of properly or was purposely changed in the history books to accommodate any given agenda. Given all the unknowns about the Gregorian Calendar alone and the notorious handling of the year “0” which distinguishes BC from AD, one can easily imagine all the opportunities for miscalculations as well as the consequences to all calendars which were created and passed down through centuries subsequently. Wherever the various inaccurate calendrical systems were utilized or cross-referenced by different cultures, civilizations or nations, we see the obvious likelihood that errors were introduced into the process of nailing down with complete certainty the first day of the Mayan Long Count Calendar. If we have misrepresented any of the aforementioned positions, we sincerely invite those authors (or their appointed representatives as in the case of both Terence McKenna and Jose Arguelles who are deceased) to advise us accordingly, and we will make the appropriate corrections. This is a very weighty subject which has great significance and far-reaching ramifications for the whole of humankind, so we do seek to get it right. Just how do we determine, with a high degree of accuracy, the end date of the Mayan Long Count Calendar? Toward that end we are compelled to seek the wisdom of the East, and especially those spiritual traditions which are scripturally informed about these matters. We refer specifically to those ancient sacred texts, the Puranas, and especially the Srimad Bhagavatam which acknowledge the cycles of the descending yugas. We know that there is a natural progression (or perhaps retrogression is a more apt description) of eras which starts with the Golden Age (aka Satya Yuga) which ultimately gives way to the Silver Age (Treta Yuga). This is followed by the Bronze Age (Dwapara Yuga) which eventually devolves into the last and final one known as the Kali Yuga* or Iron Age, the end of which is where we now find ourselves as a planetary civilization. *Kali Yuga is quite often erroneously referred to as a 432,000 year period by scholars who are simply repeating a gross miscalculation in the underlying mathematics of the relevant scriptural pronouncements on the cyclic progression of the yugas. The actual duration of Kali Yuga has been determined to be somewhere between 5000 and 5100 years long not including its dawn and twilights periods of approximately 500 years each. By this method of calculation the entire Kali Yuga cycle is just over 6000 years in duration. Alain Danielou offers an authoritative treatment of this subject matter in his book entitled “While The Gods Play”. He especially lays bare the miscalculations which have given rise to the oft-repeated and erroneous 432,000 time period advanced for the Kali Yuga. This misrepresentation should come as no surprise as we are now in the final phase of the Age of Kali, which is well known for its lack of truth in all spheres of life, as well as the wholesale dissemination of falsehood. As for the significant correlations to Mayan calendrics, we are forced to point out that the Kali Yuga is universally known to begin with the day of that Lord Krishna passed from this earth plane. Lord Krishna was known as a major incarnation of Lord Vishnu, one of the three primary deities of the Hindu Trinity. His day of departure has been calculated to be somewhere between 3102 to 3125 BC which would place him in the exact time frame when many believe the Mayan Long Count began. Therefore, our thesis provides a very good frame of reference for determining the exact start date of the Long Count. If we can pinpoint the year and day of Lord Krishna’s passing, we may very well have identified the first day of the Mayan Calendar. Whereas the exact end date is of paramount importance and can only be determined by this start date, we are greatly encouraged by this historical clue left to us by one of the most widely known incarnations of the Lord ever to walk the Earth. This is critical information for anyone intending to utilize the revelatory knowledge of the Mayan Calendar as guideposts, especially during the extraordinary compression of time which occurs during the Galactic Creation Cycle. The ebb and flow of the energies emanating from the Great Central Sun (aka the Galactic Core or Galactic Center) of the Milky Way will begin to accelerate and wash over Mother Earth in a rapid succession of increasingly more powerful cosmic waves. The time flows, particularly during this period, will be quite telling for those wishing to fully collaborate with this unprecedented evolutionary process. Likewise, the time warp, which characterizes the Universal Creation Cycle as the turning inside out of the 3rd Density* space time continuum takes place, points directly to the cosmic nexus known as zero point (what is effectively the termination point of the Universal Underworld). It would be quite helpful, especially for those who expect to fall over the event horizon at zero point, to know that their lives will not be sucked into a black hole as prophesied by some. Of course, at that exact moment in time and beyond it is asserted by many that existence in the newly emerged realm of 5th density will be one lived entirely in the present moment, also known as the eternal NOW. *Many suggest that planet Earth will actually exist in a 4th Density reality during the later phase of the Galactic Creation Cycle before the Universal Creation Cycle even begins to make its presence felt. However, we still face the dilemma represented by the various timelines shown above. For example, the divergence of the positions between Carl Johan Calleman and Jose Arguelles is so significant that one must reconcile them if one wants to align with the very powerful and dynamic energies of the Galactic Creation Cycle (aka Galactic Underworld). This particular cycle is approximately 4680 days or 12.8 years in duration and therefore relatively short compared to the entire time spiral of the Mayan Long Count. When the Galactic Underworld actually ends is of great importance, since the Universal Creation Cycle, which is only 260 or 234 days in length depending on which source one consults, occurs throughout the final 260/234 days of the Galactic Creation Cycle. The outworking of the highly accelerated energies of the Universal Underworld are simply too inexplicable to describe. Nevertheless, understanding the real time frames as they manifest will be both critical and indispensable for those who wish to fully align and cooperate with the extraordinary energies associated with the Universal Creation Cycle. It is during these upcoming and very interesting times when everyone will be greatly served by knowingly being in the flow of universal time. In light of the fact that Carl Johan Calleman and Jose Arguelles have identified end dates which are at the greatest variance from each other, we call upon them (and their representatives) to reconcile this difference. Both cannot be correct at the same time, and they both depart from December 21, 2012 by a quite substantial period of time. There do seem to be very specific reasons that each has selected their pre-ordained end date; may we ask for a public airing of the reasoning behind their well thought out decisions on this highly consequential matter? In reality, the end date of the Mayan Long Count is considered very sacred knowledge, as those who harbor such information can use it for a variety of purposes, both benevolent and otherwise. Therefore, we take the position that none of the dates proffered over the last many decades are correct. Simply put, this knowledge falls squarely into the domain of the Divine, as well as those rare and very special human instruments who have been entrusted to reveal it in the right moment. The Mayan Prophets ought to consider deeply contemplating the central points of this thesis. Before they let drop the fruit of their contemplation into the field of the public domain, they might first reflect upon just how much is at stake for the planet and humanity. Truly, the answers to the questions posed herein are some of the most telling and consequential of the age. There are three points of information which may require further elucidation, especially for those uninitiated in the realm of Mayan Calendrics. 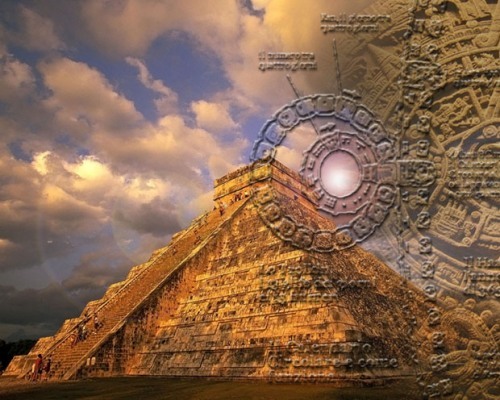 (i) The Mayan Long Count Calendar is but one cycle of time, as well as a system of analyzing the energies associated with this particular span of time, which has been attributed directly to the ancient Mayan Civilization of Central America. The true end of this specific calendar, whenever it actually does occur, does not signify the end of time; it is merely the end of a particular cycle (the Mayan Long Count Calendar in this case). Therefore, the world will not end, time will not cease to exist, and a new cycle will begin as they always have from time immemorial. Perhaps there is another Mayan calendrical system that will be revealed to the world upon the completion of the Long Count. Regardless, the Mayans have demonstrated the greatest ability in creating chronological systems (of both time flows and their corresponding energies) that the world has ever seen. (ii) Some of the terminology in this essay contains concepts which have been uniquely created, and widely disseminated, by Carl Johan Calleman. For instance the notion of the various Underworlds being analogous to the respective creation cycles was first advanced by Dr. Calleman and has no similar expression within the ancient lore and glyphs of the Indigenous Mayan Peoples. We utilize it here because so many Mayan calendar students have closely followed his work through several books that he has published on this and related topics. 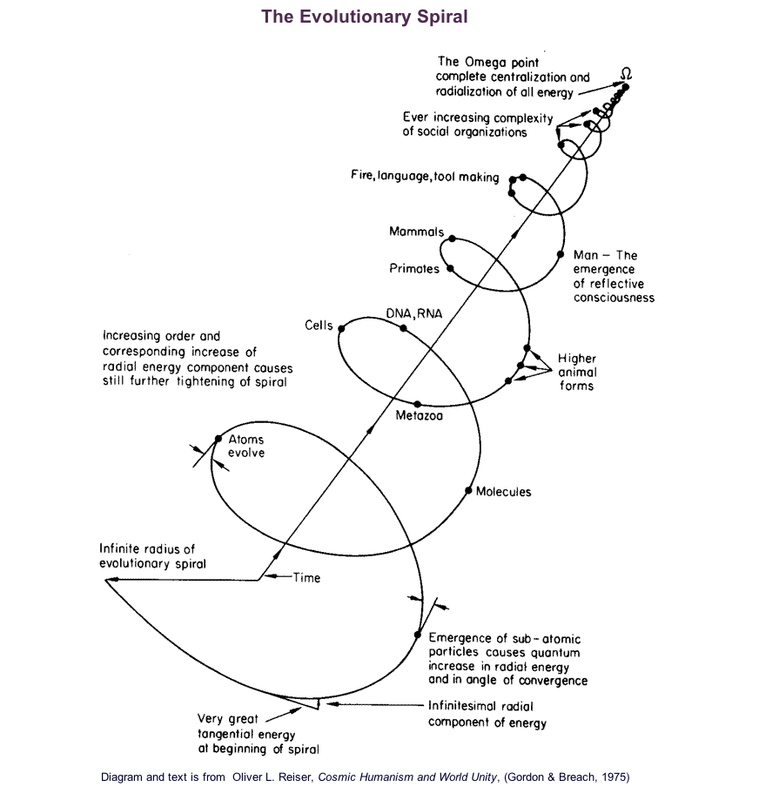 With extraordinary correlation each subsequent Cycle of Creation does represent a higher level of consciousness development according to Calleman’s central thesis; just as the synchronous evolution of the advancing Underworlds clearly illustrate the manifestation of the ever-changing energy fields and newly emerging patterns of the grand cosmic plan. The source of these extremely dynamic and transformative energies is thought by some to be the Great Central Sun of the Milky Way galaxy. Many of these same cosmologists consider our Galactic Center to be the original womb of our solar system and therefore the primordial mother of Planet Earth. Therefore, each of the seven races of humanity (ours being the 7th) who have inhabited her also share the same cosmological source. The most basic and truest pattern of the unfoldment of time seems to most closely resemble the shape of a spiral. Just as the Milky Way is a barred spiral galaxy, time appears to unfold in the space-time continuum as an ever-tightening spiral which will inevitably come to a zero point when the outworking of the cosmic plan has reached its conclusion. As the diagram below clearly in indicates, each passing day does bring relentless and inevitable change accompanied by an expenditure of both time and energy. This universal process would then necessarily point to periodic episodes of decay followed by collapse and then rejuvenation in the same manner as the four yugas follow one another. A Golden Age therefore can only follow an Iron Age, just as the phoenix of the Satya Yuga emerges from the ashes of the Kali Yuga. What makes the Mayan Calendar so unique, powerful and reflective of the reality on the ground compared to the traditional linear, uni-directional and static calendars that predominate the globe? The spiral substratum makes for a wonderfully dynamic, multi-diminesional and fluid organism, one pregnant with the infinite possibilities held within each moment of time. Truly, Mayan calendrics represents the perfect fusion of art and science as it takes its place as the world’s preeminent and peerless chronological system. 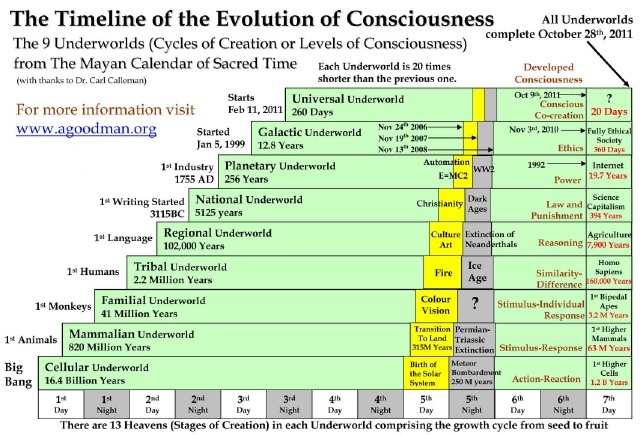 In the case of Carl Calleman’s date of 28 October 2011, it is understood that the Universal Underworld commences around February 11 of this year (Carl has also offered March 9th as the start of this period based on the 234 day long ninth wave). Therefore, given what we expect to occur during the Universal Creation Cycle, the Calleman scenario predicts the most meteoric changes and greatest compression of time ever experienced by the current race of humanity … all to begin occurring within a month’s time! And ending on October 28 as the entire planet enters a new reality, where the space time continuum is transformed into a 5th Density realm of existence. Should the extremely powerful and rapid ebb and flow of these cosmic energies not manifest according to the theory advanced by Carl’s recent paper, The Mayan Calendars and the Nine+Nine-day Count, we trust that a very good explanation will be offered to his worldwide audience. In the meantime we do highly recommend a thorough reading of Carl’s outstanding work on Mayan calendrics and cosmogony entitled The Mayan Calendar and the Transformation of Consciousness. It presents a compelling correlation between the various creation cycles and the actual historical record which the Mayan calendar had foreseen with remarkable accuracy. Jose Arguelles, who just recently passed away, deserves much credit for bringing to light the awesome legacy of the Mayan Time Lords. Jose was prominently configured in creating the “world’s first globally synchronized meditation” known as the Harmonic Convergence of August 16-17, 1987. This single event was instrumental in seeding the planetary consciousness with many of the key concepts of Mayan cosmology as well as the predictive power of the Mayan calendar. His ground-breaking book, Time and the Technosphere, is as prophetic as any of the past century. Both the BP Gulf oil spill disaster of 2010 and Japan nuclear catastrophe of 2011 stand as testaments to his extraordinary prescience (via the Mayan Long Count Calendar). Likewise, his penetrating insights and astute perceptions concerning the wisdom gifted to humanity by the Mayan Lords of Time across several disciplines is very impressive. Some authors have referred to a unique but regularly occurring galactic alignment, which might determines the exact timing of the upcoming “2012 phenomenon”. This epoch-defining alignment, they say, occurs approximately every 26,000 years (actually 25,920 years) when the winter solstice sun on December 21st is said to perfectly align with the Galactic equator, specifically at the end of the past four precessional cycles (each one being approx. 6500 years long). This astronomically dictated alignment is also known as the Origin of a new cycle or next 26,000 year period determined by the same Great Celestial Conjuction (Click on this link for a detailed explanation). 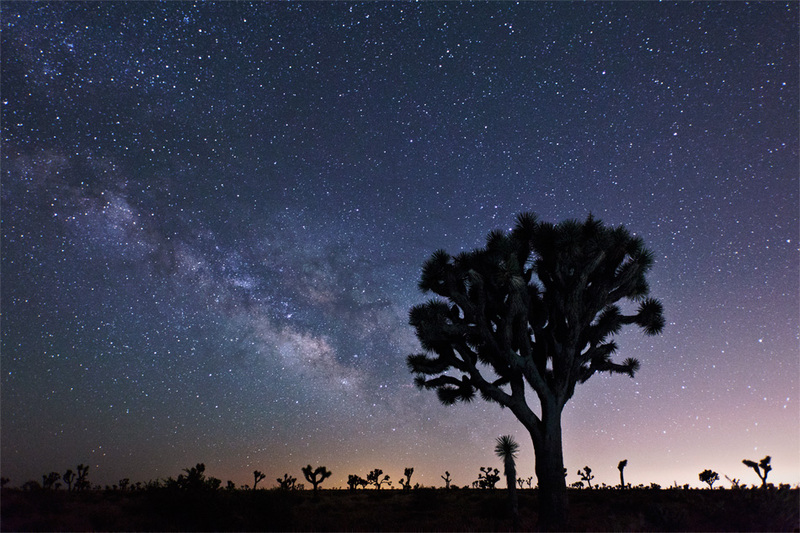 However, identifying the true center of the Milky Way Galaxy has proven to be quite difficult even for the very best astronomers; adding to that is the necessary precision required when determining the placement of the Sacred Tree over the Maya which is such a critical component of the 12/21/12 prophecy. Some astrophysicists theorize that the Galactic Center (the rotational center of the Milky Way galaxy) is occupied by a supermassive black hole whose mass is equal to 1.5% of the entire mass of the galaxy. Because the Galactic Core is a black hole, it is also quite difficult to hone in on for the purposes of determining the exact conjunction with our sun at the galactic plane. John Major Jenkins fully acknowledges the challenges involved with a definitive placement of the galactic core, which therefore makes it virtually impossible to time the exact moment of galactic alignment. Perhaps the twenty-five year period offered by some commentators is a good attempt to capture the sweep of time within which this momentus galactic transit takes place. The Harmonic Convergence of ’87 may then prove to be the initial cracking of this 25 year window, should 2012 bring the Cosmic Convergence which some are predicting. Perhaps 2012 is a cosmic meme of sorts implanted into the collective psyche of humanity as a wake up call for what really is around the proverbial corner. In which case the exact end date of the Long Count really doesn’t matter. What does matter is the true significance of the awesome and sacred time we’re living in. When telescoping back through history, especially the past 100 years, it is easy to recognize the ever-increasing and meteoric changes that have taken place. It is also easy to see how the information age, particularly with the advent of the internet, has accelerated the speed of planetary flux, in some spheres of life jumping from an arithmetic or geometric progression to an exponential one. Might these ‘interesting times’, marked by such profound and fundamental change, reflect a divinely ordained crucible of transformation for each of us to utilize for our soul’s deepest purpose? That the meme known as 2012 signifies an evolutionary threshold through which transcendent leaps of consciousness for all of humankind can be experienced that were heretofore inconceivable. That 2012 represents a cosmic junction point and unparalleled window of opportunity for profound spiritual development for the many incarnate souls who have been ripened by the formidable challenges of these “endtimes”. That the entire 2012 phenomenon is serving as a grace period of preparation for this long awaited and unprecedented Shift of the Ages, as many New Age schools of thought and mystical religious traditions have recognized. The triple convergence of Kali Yuga coming to a close, a 26,000 year precessional cycle ending and the Mayan Long Count Calendar reaching its conclusion all point to a new beginning as much as the closing of an era. As the dawn of this new epoch continues to approach, it appears more than ever that humankind is being encouraged to raise a new civilization from the ashes of the old one. Not too unlike the phoenix of ancient lore rising from the ashes of its funeral pyre … ascending to greater heights as a result of the true knowledge and wisdom wrought from the crucible of earthly experience. Pingback: HUGE Changes Coming To Planet Earth | 2012 is NOW ! 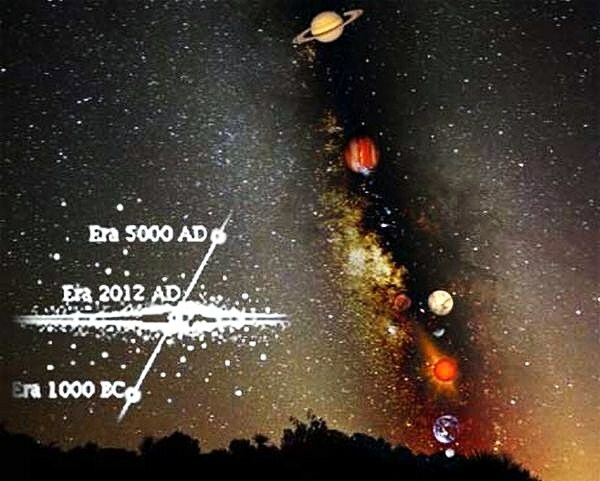 Pingback: HUGE Changes Coming To Planet Earth – from Cosmic Convergence | 2012: What's the 'real' truth?